In 1967, Fritz Scholder began his unconventional paintings of American Indians. These paintings destroyed the accepted picturesque imagery that had heretofore masked the Indian. 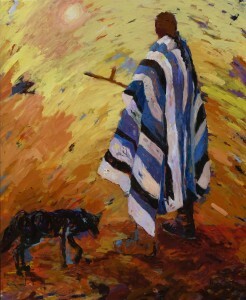 Scholder with his bold forms and bright colors demands a personal involvement with the human being…The American Indian. 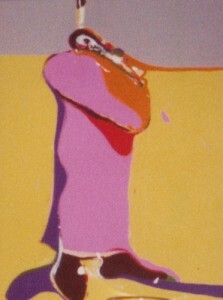 Fritz Scholder was one of the most renowned American Indian artists of the 20th century. beautiful! love this series! your work always stuns me and demands my attention. so strong, so beautiful! Kirby, I’m really excited about your blog! So far, I like your pictures better than the Old Masters. Keep Painting and writing, I’m learning from you and I love it. I love you post. They are always so informational. Small jewels of enlightenment on artists through time. Your paintings are a joy to view!! I love, “Bessingway”! Terrific composition, structural quality and painterly quality that you brought to your painting. I look forward to receiving your next blog. I am happy to discover your blog. It’s a fun way to learn about art history, which I really want to do, but don’t know where to start. I think I’ll start here! Your new pieces look great Kirby! I am in SD till Mid March. Let’s get together! Maybe a pedicure or a cuppa tea/ glass of wine Are you in SD? “The Art of the Steal” Sounds fascinating – I just found Part 1 of the movie on Youtube . Many yrs. ago I saw pieces from the Barnes In Fort Worth @ the Kimbel Museum – that was a violation of the will back then – supposedly justified to cover expenses at the Barnes…. I think this site holds some rattling wonderful information for everyone. “In this world second thoughts, it seems, are best.” by Euripides.